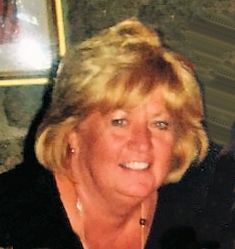 FEDERICO, Margaret “Peggy” (Quinlan), of Braintree, formerly of Dorchester, passed away peacefully after a brief illness, surrounded by her loving family on January 18, 2019, at the age of 61. Born and raised in Neponset, Peggy graduated from Cardinal Cushing High School in South Boston. For over 20 years she was a devoted employee at Boston College High School. She was an avid traveler, but mostly enjoyed spending time with her family and friends. A devoted mother, sister, daughter, aunt and friend. Together with Jimmy Federico they raised three children; Michelle Federico of Quincy, James Federico and his wife Jennifer of Dorchester, Catherine Federico of Dorchester, and her late dog Lucy. Sister of Susan Lynch and her husband Danny of Scituate. Daughter of the late Catherine “Katie” Quinlan. Loving Aunt of Daniel and Joseph Lynch of Scituate. Peggy also leaves behind her beloved nieces and nephews; Marie, Francesca, Tommy and Jake Federico. Along with many dear and special friends, Peggy will be missed by all who were blessed to have known her. Relatives and friends are respectfully invited to attend visiting hours on Tuesday, January 22nd from 4:00 – 8:00 PM at the Cartwright-Venuti Funeral Home, 845 Washington St., Braintree. A Funeral Mass will be celebrated on Wednesday, January 23rd at 10:00 AM at Saint Clare Parish, 1244 Liberty St., Braintree. Burial will be private. In lieu of flowers, memorial contributions may be made in Peggy’s memory to Marisa’s Mission, Inc., P.O. Box 850061 Braintree, MA 02185.